The latest 13F reporting period has come and gone, and Insider Monkey is again at the forefront when it comes to making use of this gold mine of data. We have processed the filings of the more than 700 world-class investment firms that we track and now have access to the collective wisdom contained in these filings, which are based on their December 31 holdings, data that is available nowhere else. Should you consider AGNC Investment Corp. (NASDAQ:AGNC) for your portfolio? We’ll look to this invaluable collective wisdom for the answer. AGNC Investment Corp. (NASDAQ:AGNC) was in 21 hedge funds’ portfolios at the end of the fourth quarter of 2018. AGNC shareholders have witnessed an increase in activity from the world’s largest hedge funds of late. There were 15 hedge funds in our database with AGNC holdings at the end of the previous quarter. Our calculations also showed that AGNC isn’t among the 30 most popular stocks among hedge funds. We’re going to check out the fresh hedge fund action surrounding AGNC Investment Corp. (NASDAQ:AGNC). How have hedgies been trading AGNC Investment Corp. (NASDAQ:AGNC)? Heading into the first quarter of 2019, a total of 21 of the hedge funds tracked by Insider Monkey were bullish on this stock, a change of 40% from the previous quarter. 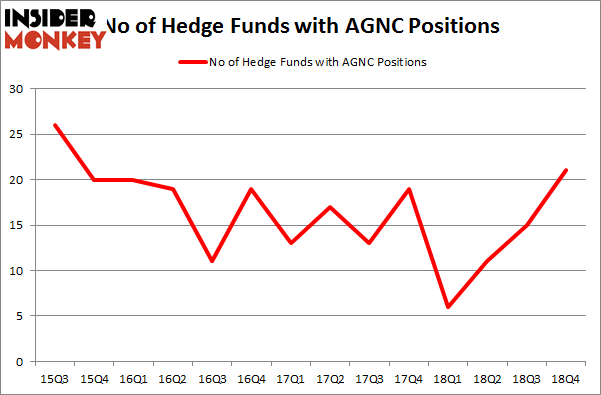 The graph below displays the number of hedge funds with bullish position in AGNC over the last 14 quarters. With the smart money’s positions undergoing their usual ebb and flow, there exists a select group of notable hedge fund managers who were increasing their stakes considerably (or already accumulated large positions). According to publicly available hedge fund and institutional investor holdings data compiled by Insider Monkey, Citadel Investment Group, managed by Ken Griffin, holds the largest position in AGNC Investment Corp. (NASDAQ:AGNC). Citadel Investment Group has a $124.1 million position in the stock, comprising 0.1% of its 13F portfolio. On Citadel Investment Group’s heels is Renaissance Technologies, managed by Jim Simons, which holds a $122.5 million position; 0.1% of its 13F portfolio is allocated to the company. 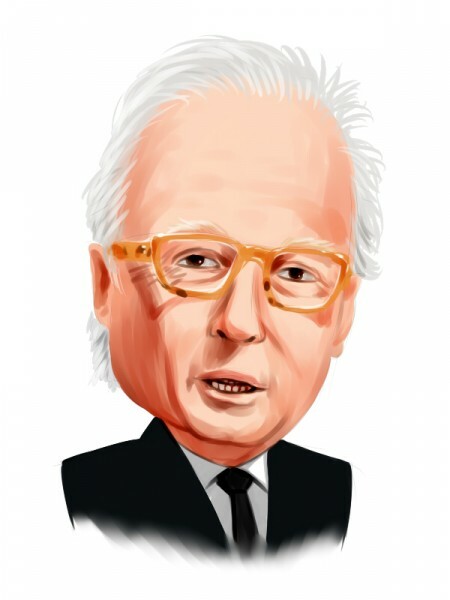 Some other members of the smart money that are bullish consist of John Overdeck and David Siegel’s Two Sigma Advisors, Anand Parekh’s Alyeska Investment Group and Israel Englander’s Millennium Management. As industrywide interest jumped, key money managers have been driving this bullishness. Alyeska Investment Group, managed by Anand Parekh, initiated the biggest position in AGNC Investment Corp. (NASDAQ:AGNC). Alyeska Investment Group had $32.1 million invested in the company at the end of the quarter. D. E. Shaw’s D E Shaw also made a $11.1 million investment in the stock during the quarter. The other funds with brand new AGNC positions are Paul Marshall and Ian Wace’s Marshall Wace LLP, Dmitry Balyasny’s Balyasny Asset Management, and Gregg Moskowitz’s Interval Partners. Let’s now review hedge fund activity in other stocks – not necessarily in the same industry as AGNC Investment Corp. (NASDAQ:AGNC) but similarly valued. We will take a look at Molson Coors Brewing Company (NYSE:TAP), Seattle Genetics, Inc. (NASDAQ:SGEN), Steris Plc (NYSE:STE), and W.R. Berkley Corporation (NYSE:WRB). All of these stocks’ market caps are closest to AGNC’s market cap. As you can see these stocks had an average of 22.25 hedge funds with bullish positions and the average amount invested in these stocks was $1042 million. That figure was $407 million in AGNC’s case. Molson Coors Brewing Company (NYSE:TAP) is the most popular stock in this table. On the other hand Seattle Genetics, Inc. (NASDAQ:SGEN) is the least popular one with only 16 bullish hedge fund positions. AGNC Investment Corp. (NASDAQ:AGNC) is not the least popular stock in this group but hedge fund interest is still below average. This is a slightly negative signal and we’d rather spend our time researching stocks that hedge funds are piling on. Our calculations showed that top 15 most popular stocks among hedge funds returned 19.7% through March 15th and outperformed the S&P 500 ETF (SPY) by 6.6 percentage points. Unfortunately AGNC wasn’t in this group. Hedge funds that bet on AGNC were disappointed as the stock returned 4.7% and underperformed the market. If you are interested in investing in large cap stocks, you should check out the top 15 hedge fund stocks as 13 of these outperformed the market. 5 Ways to Play the Autonomous Driving Trend 5 American Companies that Will Benefit From the End of the Trade War 4 Ways To Play the Ride Sharing Trend Sarissa Capital Management Hires New President Were Hedge Funds Right About Souring On News Corp (NWSA)? Were Hedge Funds Right About Souring On Teck Resources Ltd (TECK)?